Minute Amaranth is an annual herb 10-45 cm high, mostly branching from the base. Leaves are opposite or alternate, elliptic-oblong or ovate, 1-5 cm long for basal leaves, becoming shorter and narrower further up, thinly hairy to more or less hairless, more or less gradually tapering into a leaf-stalk up to about half the length of the leaf blade. Flowers are borne in small, dense spikes, 3-15 mm long, clustered in the leaf axils or on short in leaf-axils shoots. Bracts are whitish, hyaline, up to half a mm long. Flowers have ovate-elliptic tepals about 1.25 mm long, greenish-white, woolly on the outside. Capsule is included in the persistent flower and falling together. 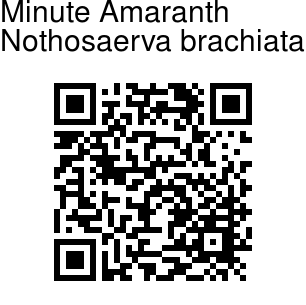 Minute Amaranth is native to India, Sri Lanka, Southeast Asia, and eastern Africa. Flowering: November-January. 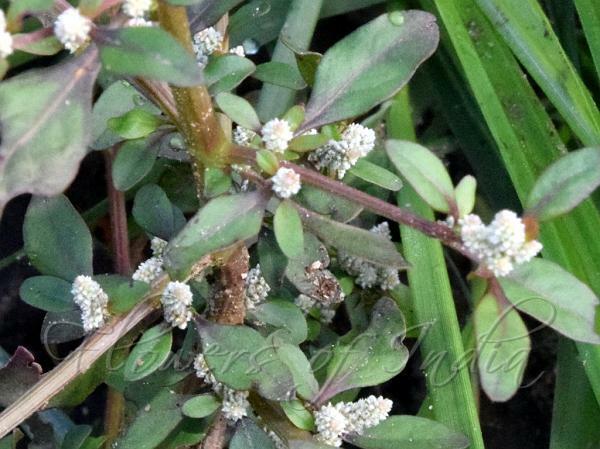 Medicinal uses: Used in Ayurveda for treatment of skin disease, stomach ache, astringent and antiseptic. Identification credit: S. Kasim Photographed in Trichirapally, Tamil Nadu.